Embroidery Design Resizing at its best! For complete list of system requirements, click the Features tab below. Adjust density if desired to improve stich-ability. NEW Embroidery hoops were added including JEF and PES hoops. NEW A hoop rotation feature has been added thereby reducing the number of hoops on the hoop list. NEW Hide embroidery hoops you don't have. 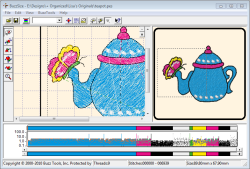 Opens and saves designs in 13 popular home embroidery formats. Thank you for creating BuzzSize! I can’t believe I had to purchase three other re-sizing programs before I found this one. What a waste of my money. BuzzSize does a terrific job at resizing my designs AND keeps my fill patterns in tack. It’s a keeper. 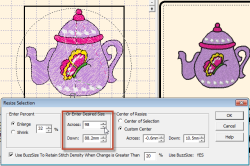 Resize designs to specific dimensions or by freehand. Resize the entire design or one color at a time. Automatically recalculates the stitches for the best sewing results. Preserves the designs original fill patterns. 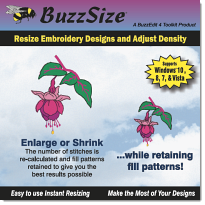 Adjust the density of the stitching in your embroidery designs while preserving the original fill patterns. Operates on the entire design or one color at a time. Convert Designs - Accurately to other embroidery formats. Visit the BuzzSize Education and Support page for more information about BuzzSize. DISPLAY - 800 x 600 Pixels or Better Display Resolution, High color recommended. I have always liked Buzz Tools, but the new BuzzSize is the best tool. I have enlarged (cause I have a bigger machine) all my favorite designs, they stitch out so nice, it is easy and I love the stretch feature. Great job! Here are just a few sample BuzzSize screens and reports. Click on any screen to view it full size. Click on the X to close the model window and return to this page. The BuzzSize workspace includes a work window (right) and a preview window on the left. You'll also find the patented stitches-in-space window at the bottom of the screen. 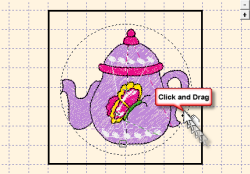 Just use the Buzz Tools > Resize command to quickly resize your design to your exact specifications.. 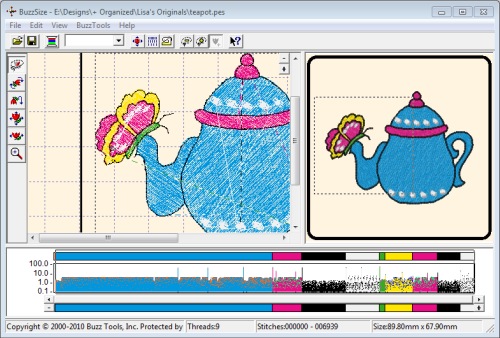 The Graphic to Stitches wizard makes it easy to use the program. Just follow the dialog and make a few simple choices to create beautiful embroidery designs. Just drag the selection border to resize. With the BuzzSize free form resizing, you just select your design (or color), click on the resize tool and drag the selection border to resize your design. It's so easy! Get creative by moving elements and changing colors. Get creative by selecting multiple colors and moving the selection to a new location like we did with the butterfly in this design. Change colors too! The following comments were submitted by users of BuzzSize. We'd love to include yours! Submit your comments now! 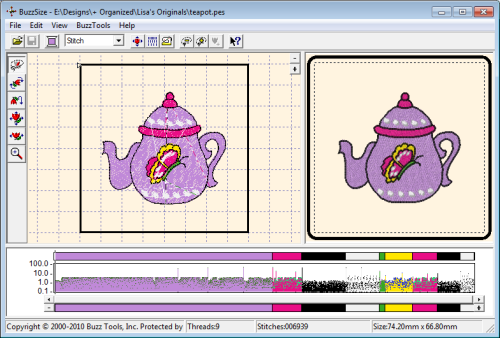 BuzzEdit with BuzzSize installed allows me resize, change colors, change stitch density, remove parts of a design, print a template for placement, etc. I just couldn't do without it. By using the BuzzEdit template I can place it exactly in the right place in the hoop. Have recently bought BuzzXplore and BuzzSize and can't believe how user friendly they both are. I just love them and won't use any other program in the future. " I love BuzzXplore and all it does, but the Buzz Size program blew me away! It sizes designs better than any program I've ever used. No skipped stitches, unless the original already had them. Thank you for making this program! I can not say how extremely easy Buzz Catalog, Edit and Sizing were to use. It was unbelievable even if I knew nothing about computers. Your videos are terrific, they are so easy to follow! Thank you for making everything so simple and easy. Also, thank you for making the trial 21 days, since some of us can not sure it every day. This gives us time to learn, experience and get HOOKed. Thank you for creating BuzzSize. I can’t believe I had to purchase three other re-sizing programs before I found this one. What a waste of my money. 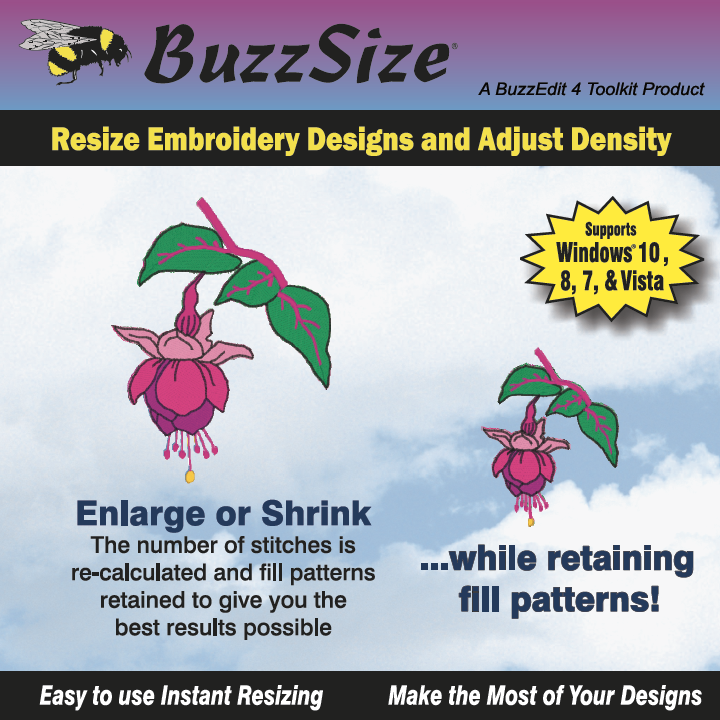 BuzzSize does a terrific job at resizing my designs AND keeps my fill patterns in tack. It’s a keeper.